St. Ailbe’s School has a proud tradition of providing for the educational needs of its students. The school is situated on a superb site with exposes playing fields, the use of a modern sports complex. As all except a small number of local students who go home for their lunch – remain on the school grounds during lunch time, we have improved facilities for students by providing a canteen. Breakfast is provided each morning and students can purchase a wide selection of hot and cold food before school, at break times during the day and also at the end of school just before evening study. The school has a highly qualified and dedicated staff who give willingly and generously of their time and effort to provide an ever increasing range of extra-curricular activities for our students. 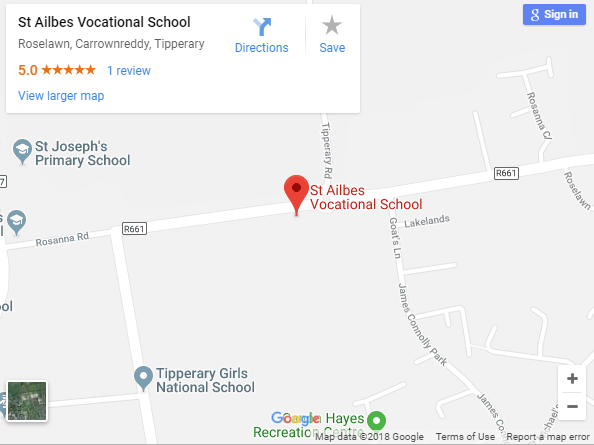 St. Ailbe’s School offers students a wide range of subjects to Leaving and Junior Certificate standard, at both higher and ordinary level. The Leaving Certificate Applied Programme provides opportunities for students who are not adequately catered for by other Leaving Certificate programmes. The transition from primary to post-primary school can be a difficult time for some students. We recognise this and have in place a school induction programme which allows first year students to make the transition as easily as possible. This is facilitated by having only First Years attending on returning to school after our summer break. This helps them to get to know the layout of the school before the general body of students return. The main aim of the school is to provide an environment where each and every student develops to their full potential both academically and socially. Our pastoral care programme is designed so as to ensure that the personal development of our students is catered for alongside their academic needs. On completion of the Junior Cycle the majority of students opt for the Fourth Year Programme.